Anushka Sharma plays a feisty Gujarati who goes on a solo trip to Europe in Imtiaz Ali's Jab Harry Met Sejal. Anushka, who recently returned from New York, discusses her new film and reveals that she has a cameo in the Sanjay Dutt biopic. This is your third film with Shah Rukh Khan. What is your equation with him like? I think it has become better because I am more confident as an actor. My equation and the relationship is better. He is the same person, as he has always treated me nicely. He was supportive in my first film Rab Ne Bana Di Jodi. I value that and am very grateful to him. When I was nobody, he was so nice to me. He never discriminated or differentiated. When you do well in life, people are nicer to you, but he is always nice. 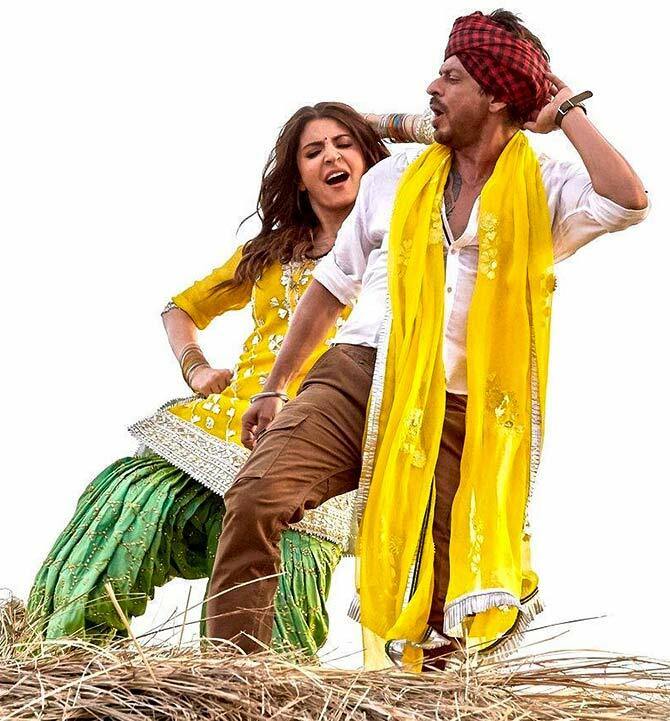 IMAGE: Anushka Sharma and Shah Rukh Khan in Jab Harry Met Sejal. Does your character stereotype Gujaratis? Young Gujaratis don't speak with such a pronounced accent. Can you say no Gujarati speaks like that? If you can tell me for a fact that no Gujarati speaks this way, I would accept it. I had asked Imtiaz this as well. He said he has met girls who talk in this accent and that is what he found charming about them. Also, the way in which Sejal speaks denotes her limited experience in life. She is someone who has gone to a Gujarati medium school. She has gone out only with cousins. Her vacations are with family only. So, it is also to denote that kind of limited exposure that she has in life. In fact, the girl who taught me that accent -- her name is Dimple -- is from Mumbai and she talks just like that. She doesn't fake it. Imtiaz is known for his intense and contemporary love stories. So how did you approach your character? Imtiaz works in an interesting manner. His personal understanding of the character is very deep. He gives a proper backstory of the person and that is data not every director provides you with. Sometimes, the actors have to do a lot of work themselves, but Imtiaz makes it easy for you. So you have to follow his vision and perception of these things. I have truly appreciated his work. I like the complexity and simplicity of the characters that he delivers on screen. IMAGE: Anushka and SRK in Jab Harry Met Sejal. How will Sejal stand out from the rest of the characters you have played? What I like about Imtiaz is that his female characters are well defined. They have this journey through the film, the coming-of-age of a character through the process of falling in love and getting affected by the person's presence in your life. That comes out beautifully in his films. Even Sejal has a journey, where she connects with her true sense. You have worked with Yash Chopra, Aditya Chopra, Rajkumar Hirani and now Imtiaz Ali. Do you consider yourself lucky? The fact that they choose me over everybody else in their film makes me special. It's nice that so many different visionaries can imagine me in their stories. Ultimately, only a director can add value to your career and give you that diversity as an actor in portraying characters. IMAGE: Anushka and Aamir Khan in Rajkumar Hirani's PK. What's the best and worst part of being an actor? The only bad part is that you are constantly being judged. People form strong judgments without even knowing much about you. The good part is that you are very privileged. You are among the few who get to do what a lot of people want to do. You should be grateful. As an actress, you get to play so many characters and understand so many personalities -- in a way, that helps you to develop your personality better. Has anything changed since the time you spoke about sexism? (During a chat with film critic Rajeev Masand, Anushka had commented on the existence of sexism in Bollywood. She had said that girls were just expected to be good looking and 'interesting enough for a guy to be interested in her' in a film. When I spoke about that, I was not talking about myself, but in general. No, it hasn't changed, but yes, we are moving positively towards that change. I think you can't hold the industry to it alone because it has to do with people. When you do female-centric films, why don't they open to the same box office numbers as the male-centric films? This is such a deep-rooted thing. We have not expected much from our female actors for so many years; just seeing them compliment a hero. So it will take time for us to get there. We are all pioneers of this change. We may not be able to see the real benefits of this change completely, but at least we are doing something that will help the process. 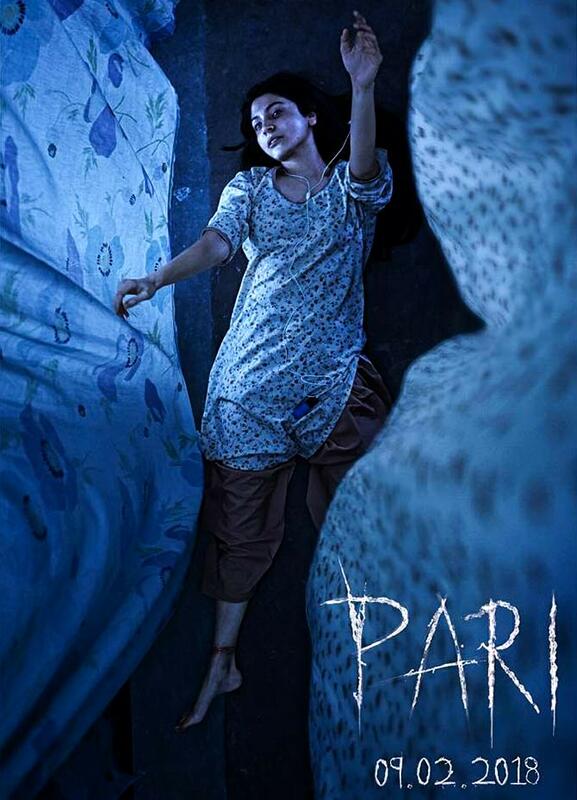 The posters of your new production Pari look intriguing. What is it about? It's too early to talk about the film, but I am happy with the curiosity. I want people to keep guessing till we actually talk about it. How taxing is it for an actor to produce films? It is taxing and yet, rewarding because you are able to create cinema. I am happy that we have managed to create different content in the films we have done so far, and will continue to so with Pari. You will be working with Shah Rukh Khan for the fourth time in Aanand L Rai's next. After Jab Harry Met Sejal releases, I have to shoot the last schedule of Pari . Then, I will start shooting for that film. I keep meeting Aanand Rai to discuss the film. Any plans to do films down South? I find it difficult to do a film in a language I don't understand or can't speak fluently. If you don't understand what you are saying, how will you act?